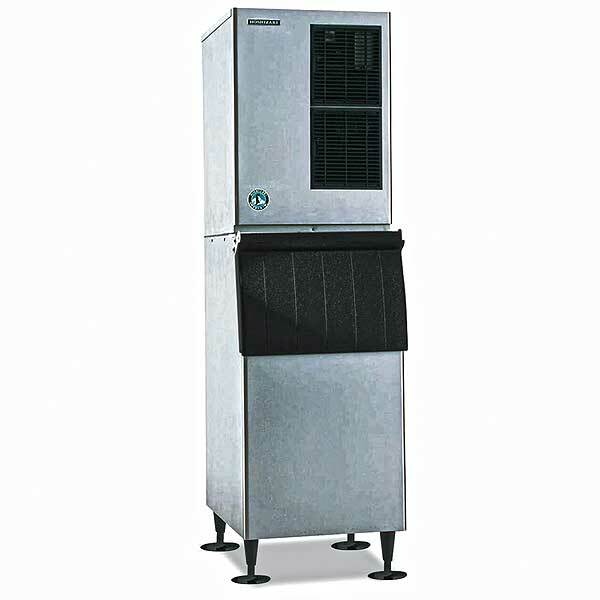 Ice maker available in water and air-cooled models. Up to 630 lbs of ice production every 24 hours. Crescent cubes. 22 inches wide. Stainless steel finish, crescent cube Style, R-404A refrigerant, 115v/60/1-ph, 14.8 amps, NSF, UL listed. Makes individual crescent cubes. Mount two ice maker units side-by-side on B-700, B-800, or B-900 bins for double ice production, and get the benefit of redundancy with 2 independent machines. We recommend bin B-700 with H52130 adapter for this machine (see below).